New York Times bestselling author Anthony Swofford weaves his experiences in war with vivid accounts of boot camp, reflections on the mythos of the marines, and remembrances of battles with lovers and family. When the U.S. Marines -- or 'jarheads' -- were sent to Saudi Arabia in 1990 for the first Gulf War, Anthony Swofford was there. He lived in sand for six months, he was punished by boredom and fear, he considered suicide, pulled a gun on a fellow marine, and was targeted by both enemy and friendly fire. And as engagement with the Iraqis drew near, he was forced to consider what it means to be an American, a soldier, a son of a soldier, and a man. After listening to about 6 of the 8 disks, I realize that I don't like this guy very much. If I follow the timeline correctly, he attempted both suicide AND murder before he even saw a combatant, and then blames his problems on the Marine Corps and war. However, he does have a very good style of writing, and I hope that he gets over himself, gets some medication, and gets moving on a next book. I had seen the movie, so I was interested in the book. I was very dissapointed with the narrator. He was horrible. There was no emotion in his reading. It almost sounded like droaning. Which is sad because I really enjoyed the movie. It's just OK for a memoir but read awfully in a completely monotonous tone. The author writes well, his discriptive techinique is really amazing but why is it that they have the author reading this story? He has no talent for the read. His style is monotone, there is absolutely no inflection in his voice. It was very annoying, and I found my mind wandering frequently. Reading is a talent not every author has. Did not finish it. Should be read, not listened to. Thank you, Anthony Swafford, for sharing your thoughts and experiences. I am the richer for it. This book was terrible, the author must be a disgrace to the marine corps and I am truly sorry he was ever allowed to serve this country. Couldnt even finish the second disk. Unfortunately this book is repetitive and introduces us to a self UNaware soldier. His reading voice is irritating as well. I hoped to get some insight into "a marine" and I guess I did if Marine's are generally one dimensional and immature. I somehow doubt that that is generally the case so I am dissapointed. I must admit that I did not listen to the last half and it might have improved. For the first time, I did not even finish the book. Between the language and the author's self-deification, i simply could not listen. If you are thinking of either listening to, or reading, this book - reconsider. Caustic and blunt, Anthony Swofford gives a personal, extremely graphic and honest portrayal of the Marine Corps and the First Gulf War as he experienced it. As the author admits, it is difficult to distinguish between perception and literal reality, but Swofford's story is heartbreaking and compelling regardless. Read by the author himself, which I felt lent power to the narrative. Well done. This book is a fascinating reflection of one man's experience with the Marines & war. He doesn't actually discuss his war experience, but rather waiting for the war to start, and afterward. It is profane, but compelling. 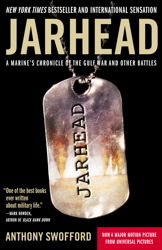 I recommend it to others who want to know what it's like to be a jarhead.